Polygreen Foam is an environmentally friendly, impact absorbing and drainage pad for use in a wide variety of applications. 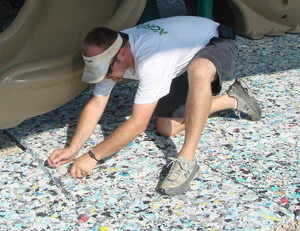 Light Density Foam: 4-7 lbs per cubic foot is very popular as a cushion and drainage layer underneath playground surfacing including synthetic turf. 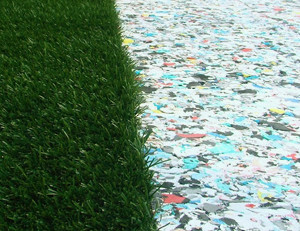 Medium Density Foam: 8-10 lbs per cubic foot is used for a variety of drainage and cushioning applications including as a partial replacement for crushed stone in synthetic lawn turf applications. High-Density Foam: 11-13 lbs per cubic foot is used as a drainage and impact layer for synthetic turf sports field applications. It is also very popular as a drainage and crushed aggregate replacement in agricultural uses. The standard width of our product is 4ft. We can cut lengths of product to any length ranging from 3ft up to 250ft rolls depending on thickness. Thicknesses range from ½” up to 2 ¼”. Planed Product – Most padding is planed on one side to create tighter tolerances. Drainage Channels - Adding drainage channels on the bottom side of our foam sheets can enhance lateral drainage in a variety of applications. We can customize our products to meet your specific specifications. Below you will find the standards that we use to determine general fall height requirements. If you are needing testing reports for the fall height they will need to be obtained from your turf supplier. True testing must be done once the project has been completely installed over a specific base, pad, turf and sand infill to get an accurate fall height measurement for test reports/certifications.